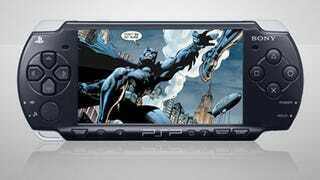 The electronic comic book movement gains momentum today, as Batman and Superman publisher DC Comics finally goers digital, offering downloadable comics for the iPad, iPhone, and Sony PSP. Marvel does it. Image does it. Even Dark Horse has electronic versions of many of their comic books available for purchase online. The one, major holdout has been DC Comics, home of iconic heroes like Batman, Wonder Woman, and Superman, as well as the Wildstorm imprint, which is quickly becoming the go-to label for video game-based books. Seemingly out of nowhere, DC Comics is digital, with a wide selection of books ranging from free to $2.99 now available on the iPhone, iPad, and PSP, including a special free 10-page preview of Superman 700 by J. Michael Straczynski and artist Eddy Barrows. "At DC Comics, it has been a top priority that DC forges a meaningful, forward-looking digital strategy," said Jim Lee, Co-Publisher, DC Comics. "As both a comic book creator and Co-Publisher, it was incredibly important that our plan includes not only creator incentive payments, but also an innovative component that supports comic shop owners. We see digital as an opportunity to grow our entire business." While PSP versions of DC Comics will be available directly through the PlayStation Store, iPad and iPhone users will need to download the new DC Comics apps, powered by comiXology, or through the DC-branded store within comiXology itself. A portion of the proceeds of books purchased through comiXology will be reinvested in initiatives to help promote traditional comic book stores. This is a turning point for electronic comic books. Now that every major and many minor publishers are on board, the business can begin to evolve and mature. Perhaps one day soon we'll see same-day releases in digital and print.